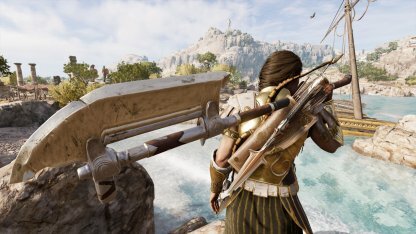 Find out which weapons are the best in the game with the Best Weapon Ranking guide & list for Assassin's Creed Odyssey. 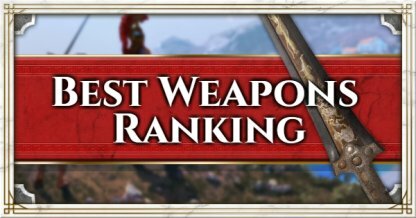 Also included are recommended weapons per category. 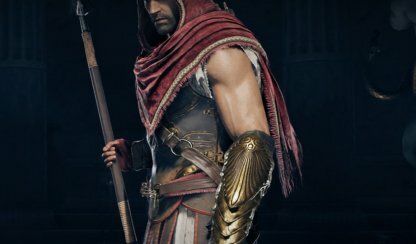 The ranking for the Top 10 weapons in Assassin's Creed Odyssey is based on the weapon's versatility, unique perks, effectiveness in combat, and overall use. 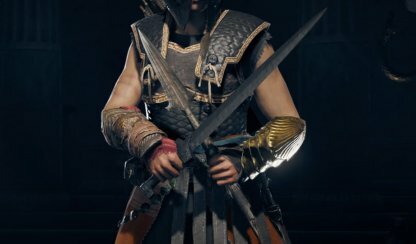 *All Weapon's Max DPS is Capped on 2599 for Melee Weapons and 2260 for Bows. Minotaur's Labrys The Minotaur's Labrys lessens the Adrenaline cost of Overpower abilities, allowing you to use it more often to extensively damage opponents. 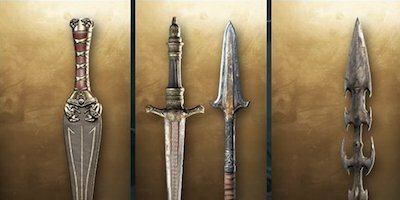 Sword of Damokles The Sword of Damokles's stat bonuses focus on Adrenaline generation per hit & per CRIT. This is very effective in every combat mode, be it brawling or assassination. 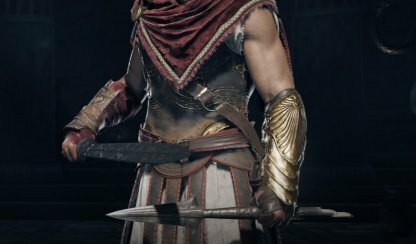 Harpe of Perseus The Harpe of Perseus lessens the cool down time for all abilities, making it an extremely convenient & effective sword in combat. Hades's Bow Hades's Bow turns normal arrows into fire arrows. It removes the need to craft fire arrows plus boosts Fire Damage as well. 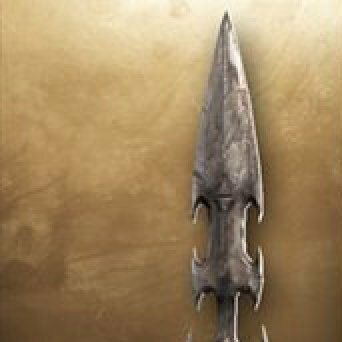 Dagger of Kronus The Dagger of Kronus exponentially boosts damage when attacking opponents from behind, making this the perfect weapon for assassinations. Arachne's Stingers Arachne's stingers not only grant bonus Poison Damage, it turns all Weapon Damage into Poison Damage. It's effective for attacks that deal damage over time. 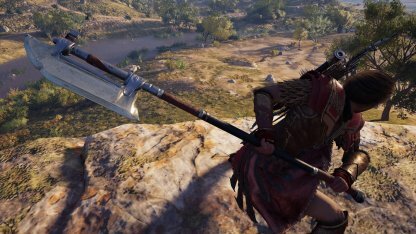 Polyphemos Cyclops Bludgeon This bludgeon grants a 25% Damage bonus to Elites & Bosses. It's very handy for Conquest Battles, going through the story, or hunting down legendary creatures. 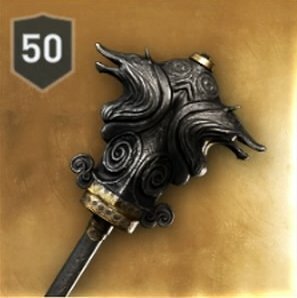 Mallet of Everlasting Flame This mace turns all Weapon Damage into Fire Damage plus it boosts Fire Damage as well. You can perpetually set enemies on fire until they burn down. 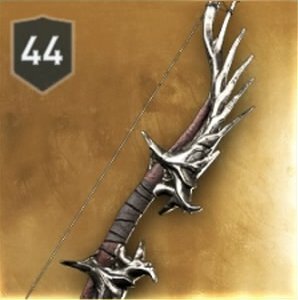 Fanged Bow The Fanged Bow turns all normal arrows into poison ones and also boosts Poison Damage, making for great damage over time. Poseidon's Trident Poseidon's Trident grants the unique perk of breathing underwater. It's very useful when diving into underwater treasure spots or facing marine predators. 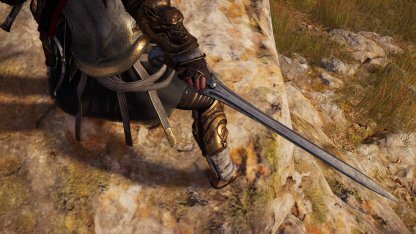 Swords have balanced speed and power in Assassin's Creed Odyssey and is dual wielded with the Spear of Leonidas. Its strength lies in its versatility in battle. 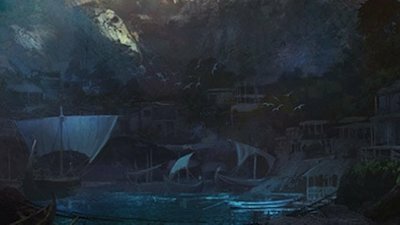 Complete the final episode of the Main Quest Story to get the Sword of Damokles. It will be awarded to you upon defeating Deimos as a cultist. 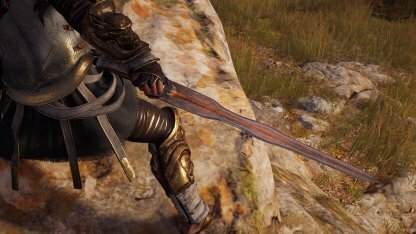 With "+10% to All Adrenaline Gained" and additional damage to Warrior skills, the Sword of Damokles is a powerful weapon to wield in close combat fights even against multiple enemies. Make the best out the Sword of Damokles by getting perfect dodges in battle since those give more adrenaline. The slowed time will also give you an opening to counter with a special ability! 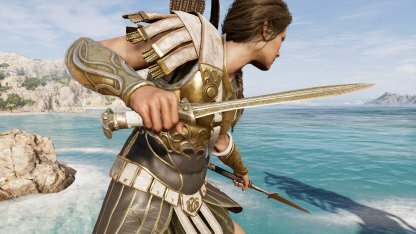 You will receive the Harpe of Perseus upon defeating Medusa in the "Writhing Dead" quest. 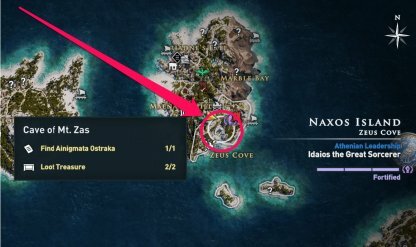 You can start the quest line by doing the "Romancing the Stone Garder" quest in the Petrified Islands. 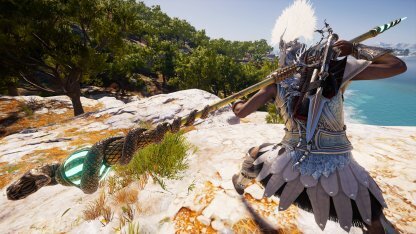 The Harpe of Perseus has a unique perk that reduces all Ability cooldown duration by 25%! Its additional CRIT damage is also plus when fighting against stronger enemies. With the shortened Ability cooldown, you will have to balance out your adrenaline usage. 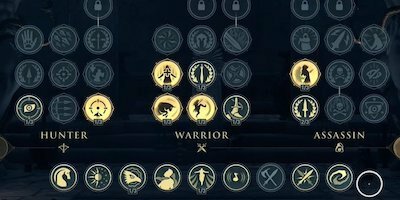 Use abilities after or before every melee combo to utilize the shorter cooldown, while still conserving adrenaline. 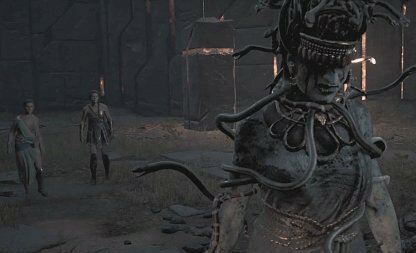 You will receive the Xiphos of Dionysus upon defeating the cultist Pausanias in Episode 7 of the Main Story Quest. You will defeat him in the quest "A Bloody Feast". 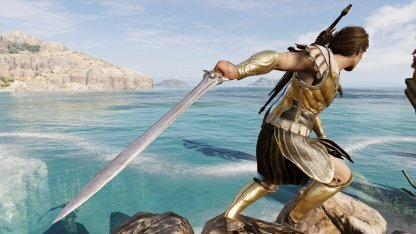 The Xiphos of Dionysus when equipped will greatly raise the chances of you killing off enemies when using Asssassin abilities thanks to its additional damage to Assassin skills and CRIT damage. Use the Xiphos of Dionysus when you are more focused on a stealth type of gameplay. It's additional damage to the Hero Strike Ability will help you deal with enemies quickly if you get found. Daggers have really fast swing speed so you do more attacks with it. However, it is balance out with being less powerful than other weapons which makes it reliant on the hit-and-run gameplay. You get the Dagger of Kronus when you kill the cultist Chrysis either in the main quest or the side quest. 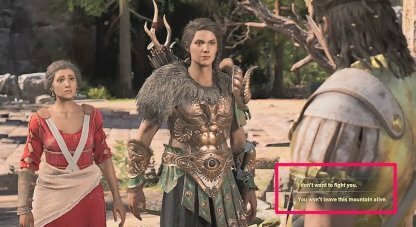 It is recommended to defeat her in the side quest instead to get extra XP with the weapon. 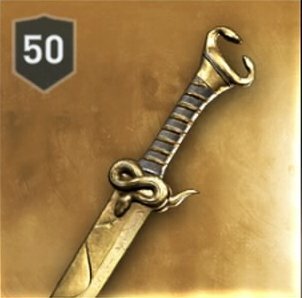 This weapon can easily take down enemies when you assassinate from behind thanks to its 40% damage buff when attacking from behind and 15% damage with daggers! Use Ikaros to check enemy positions and sneak your way around them. Always position yourself to assassinate them from the back to get the best out of this weapon. 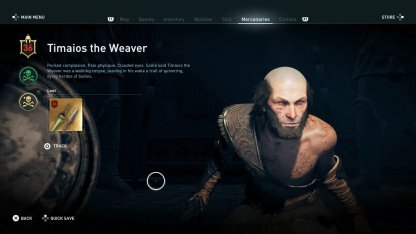 Arachne's Stingers can be looted on a Mercenary with the title "The Weaver". However, you can only encounter the Mercenary when you're at level 43 and they have no fixed location. Arachne's Dagger turns all weapon damage into poison damage. 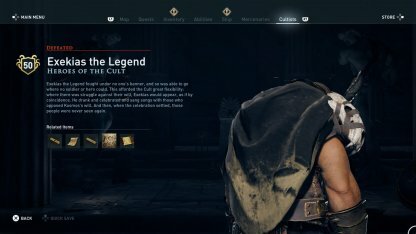 With its Assassin Damage damage buff and additional 20% buff to Poison Damage, it can make quick work of an enemy's health. 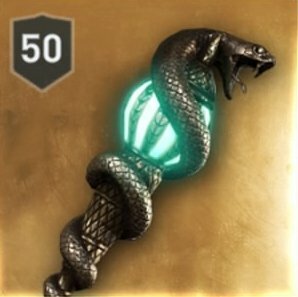 When using this weapon as your main one, it's best to invest some Ability Points to the Venomous Attacks and Poison Mastesy skills. This will further increase the damage your poison attacks inflict. 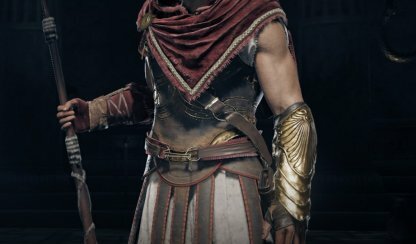 The Greek Hello can be bought in the Helix Store for 250 Helix Credits. 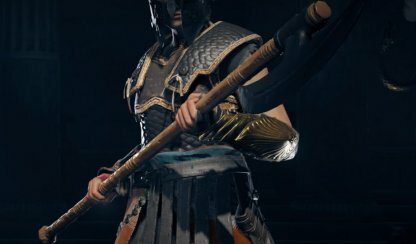 The Greek Hello is unique in which it adds 15% to All Damage, but balances it out by taking 15% off the players health. It also has +15% damage to Assassin Damage and +25% to CRIT Damage. Strike then keep your distance before striking again is the best gameplay to adopt with this weapon. This ensures that you make use of the additional damage without putting yourself at risk of dying. Heavy Blunt Weapons hit really hard, but at the cost of being very slow to attack with. When using them, patience is key as its slow swing speed makes you vulnerable to enemy attacks. The Mallet of Everlasting Flame can be looted from the Mercenary with "The Smouldering" title. 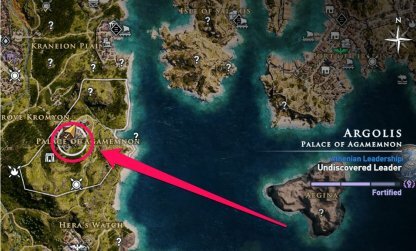 They have no fixed location and players can only encounter them at level 46. 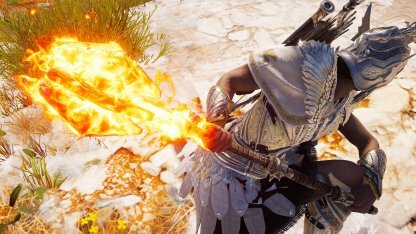 Set your enemies on fire as the Mallet of Everlasting Flame turns weapon damage into fire damage. It's damage buff to warrior skills and fire damage further amps this weapon's power. 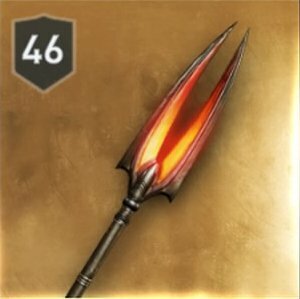 When using this weapon as your main one, it's best to invest in the Flaming Attacks and Flame Mastery skills to further raise the damage potential of this weapon. 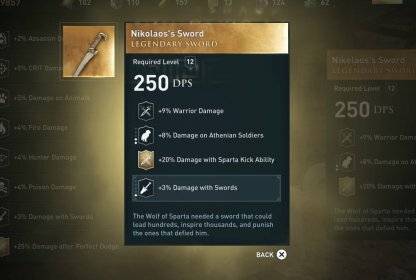 This legendary heavy blunt weapon is hidden in a legendary chest in the Palace of Agamemnon in Argolis. 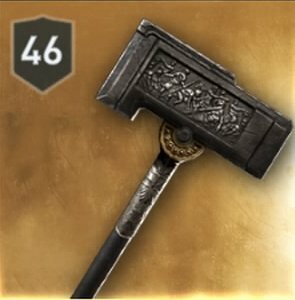 The Hammer of Jason is a formidable weapon that increases the damage to the Shield Break Ability by 20%. 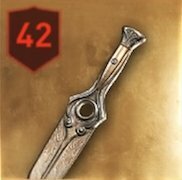 With this weapon, you can easily bash through enemy shields and their health. Adding ability points to the Shield Break Ability is a must if you plan on making this your main weapon. Start your battles with the Shield Break Ability then start swinging to continue the aggro. You will have to track down and kill the cultist Exekias the Legend who roams Greece. 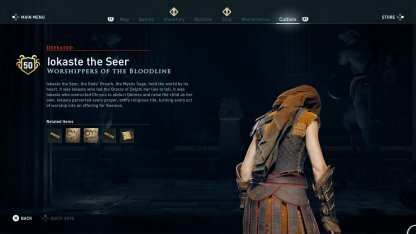 You can start to track cultists down after completing Episode 3 of the Main Story Quest. 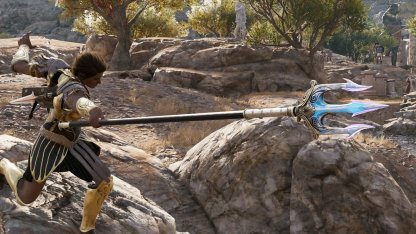 Typhon's Mace is a heavy hitter thanks to its additional damage to Heavy Blunt Weapons and to the Charged Heavy Attack Ability. Invest Ability Points on the Charged Heavy Attack Ability to get the best out of this weapon. 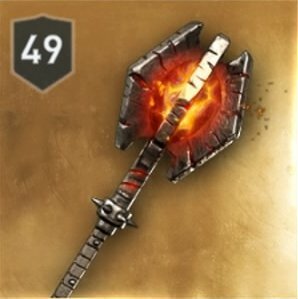 Start your attacks with the Charged Heavy Attack then go into a melee combo when using this weapon. 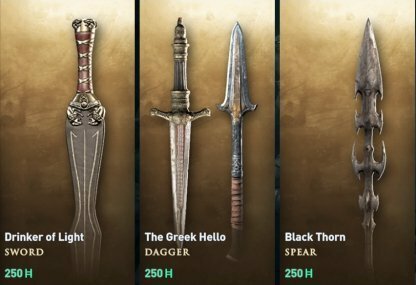 Spears have a good reach and thanks to its average speed and power, it can easily be used in any situation. Make sure to know the reach of your weapon to keep enemies at a distance. 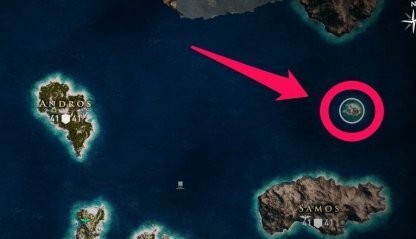 You can find the trident on the unnamed island north of Samos. The spear is stored in a decorated chest in the center of the temple dedicate to the God of the Sea. 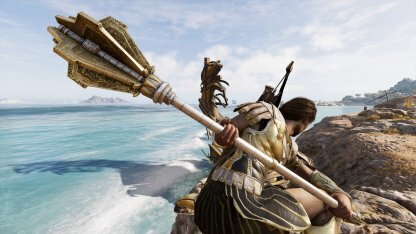 Poseidon's Trident has one of the best utility perks available and the weapon can be found without issue at an unnamed island. It's a good weapon to have as it's strong by itself. 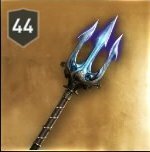 Utilize the range of Poseidon's Trident by attack at mid-range. Use your charge attack to swing the trident and hit multiple enemies at once. 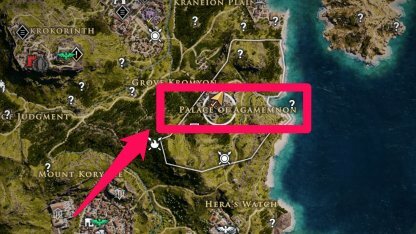 Hades's Bident can be looted in the Temple of Agamemnon inside the Palace of Agamemnon in Western Messenia. Hades's Bident amplifies the damage of the Ring of Chaos by adding 20% damage to the ability itself and another 15% to Warrior Damage. 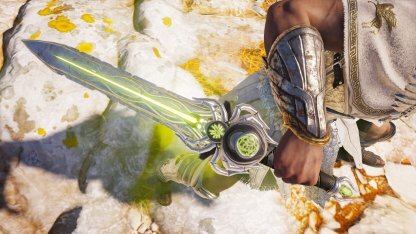 With this weapon, the Ring of Chaos becomes extra deadly. Max out your Ring of Chaos ability to get the best out of this weapon. When attacking, start off with the Ring of Chaos then go into a normal melee combo when the enemies have been staggered. You can buy the Black Thorn from the Helix Store for 250 Helix Credits. 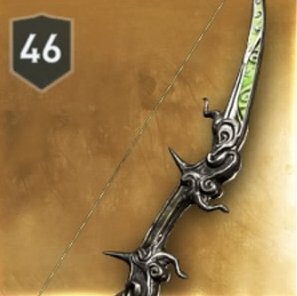 The Black Thorn is a good spear to have in early games thanks to its additional damage to Warrior abilities and CRIT. It also raises the CRIT chance when using Charged Heavy Attack. 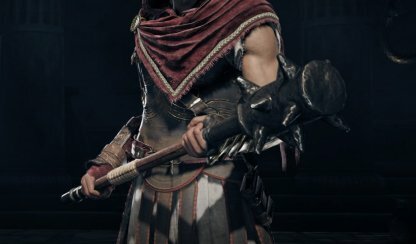 Mix melee combos with the Charged Heavy Attack when using the Black Thorn. 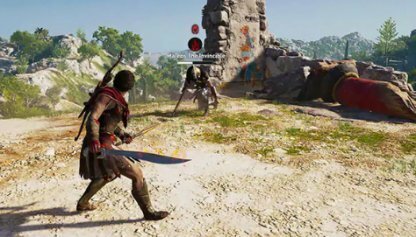 Just make sure you can do the Charged Heavy Attack without being canceled out by an enemy attacks. The Staff hits really quick, but not really hard. When using this weapon, you have to move around an enemy and attack them from different sides to take advantage of its quick speed. 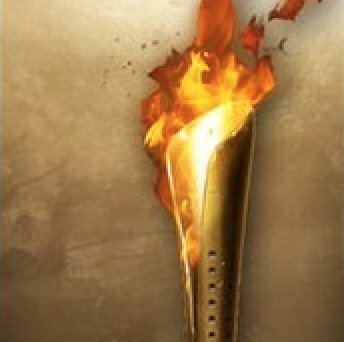 The Olympian Torch can be bought from the Helix Store for 250 Helix Credits. 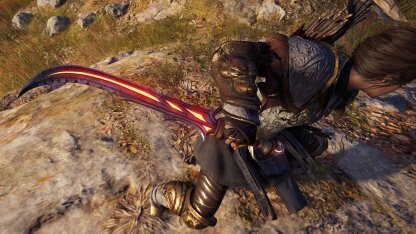 The Olympian Torch adds damage to fire attacks with its additional fire damage and elemental buildup with Warrior Abilities. This is further added up with 15% increase to Warrior Damage. To make full use of this weapon, add ability points to the Fire Mastery and Fire Attacks Skills. This way, all your attacks will have fire damage that this weapon can increase! 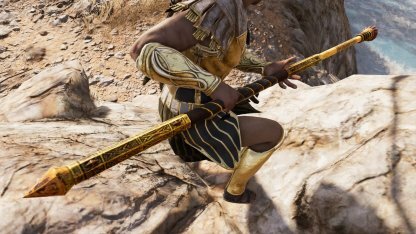 You will receive the Rod of Asklepios when you find and kill the cultist "Iokaste the Seer" in the Petrified Islands. 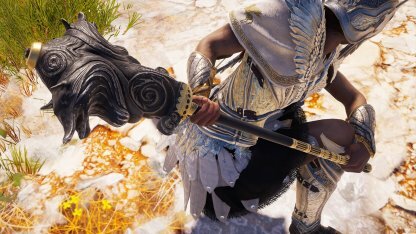 What makes the Rod of Asklepios unique is in its perk that converts CRIT chance to damage. However, this will remove your ability to inflict critical damage. 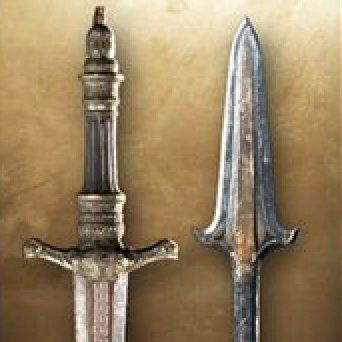 When using this weapon, use armors that have an engraving that raises CRIT chance. This way, you will further increase your damage even if you can't do critical damage to enemies. The Witch's Staff is a reward for the "Heart of Stone" side quest in Pirate Islands. The Witch's Staff performs well during the earlier parts of the game due to its additional damage to Hunter abilities and another damage buff to All Damage. Take advantage of All Damage buff by alternating between melee combos and abilities when using the Witch's Staff. Heavy Bladed weapons hit like a truck, but has very slow swing speed. 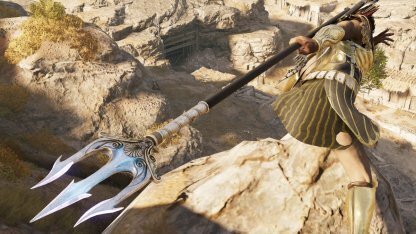 It has a charge attack though that allows players to hit multiple enemies in one 360 degree swing! 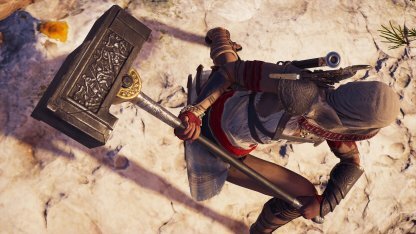 The Minotaur's Labrys is a reward for defeating the Minotaur and completing the "He Waits" quest in Messara. 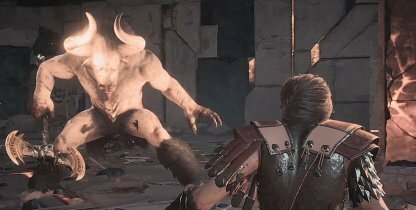 "He Awaits" is the final quest in the "Myths and Minotaurs" side quest line. 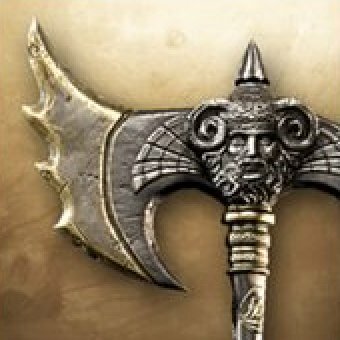 The Minotaur's Labrys has one of the most useful perks in the game, decreasing adrenaline cost for overpower abilities. On top of that, it increases damage for both Warrior abilities and critical hits. Take full advantage of the decrease in adrenaline cost by alternating between melee combos and overpower attacks. Do perfect dodges to get more adrenaline to do overpower attacks. 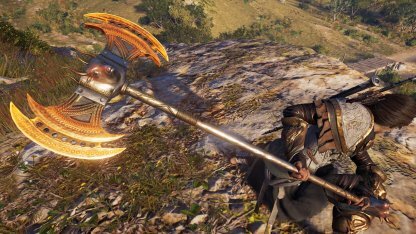 You will receive the Polyphemos Cyclops Bludgeon when you defeat the Cyclops and complete the "Stairway To Olympos" Side Quest from Kythera Island. 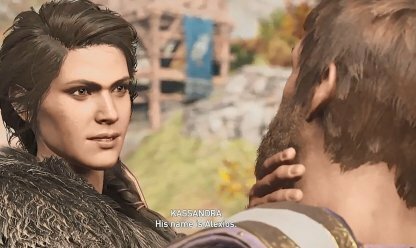 Begin the quest line with "God Among Men". 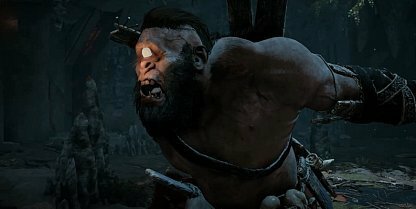 Make quick work of elite enemies and bosses with Polyphemos Cyclops Bludgeon. 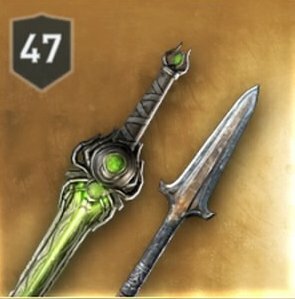 Its +25% damage to elites & bosses and another +15% damage to heavy bladed makes it extremely powerful. 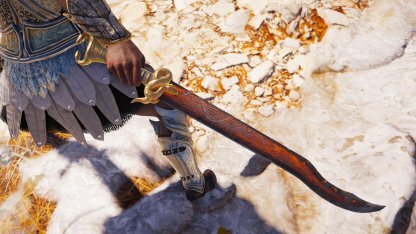 When fighting elite enemies, such as captains and polemarchs, and Bosses, like the mythical monsters, switch to this weapon to do even more damage against them. You can buy the Swift Slayer for 250 Helix Credits at the Helix Store. 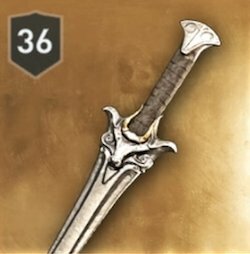 Swift Slayer takes advantage of parrying against enemies with its +15% Damage with Heavy Bladed Weapons and +50% Damage and Elemental Buildup after Parry perks. Patience is key with this weapon. 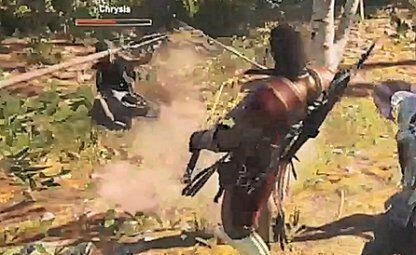 Wait for the perfect chance to parry and once successful, counter with a flurry of attacks while the enemy is staggered for a few seconds. Only bows in the game can do damage from a distance. 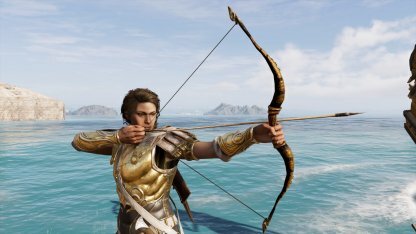 It's more skill based though as by itself, players have to take note of distance and projectile drop when firing arrows. 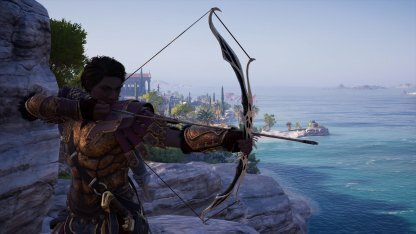 You can loot Hades's Bow from the Mercenary with the "Of the Ashen Wake" title. He will start to appear when you get to Level 44. 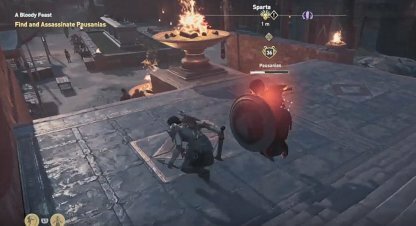 Hades's Bow will allow you to rain fire to enemies as it turns all Basic Arrows into Fire Arrows. The damage is further amplified thanks to its +20% Fire Damage perk. 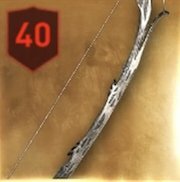 Fill out the Fire Attack and Fire Mastery to take full advantage of this bow. 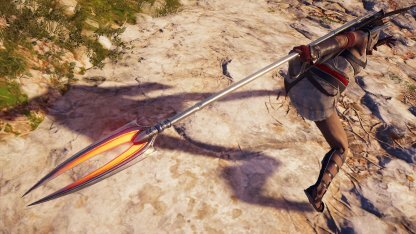 Don't waste fire arrows by using them with Hades's Bow. To get the Fanged Bow, you have to loot the legendary chest located inside the cave of Mt. Zas in the Cove of Zeus in Naxos Island. 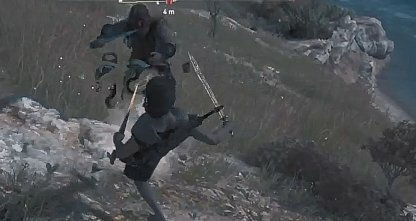 The Fanged Bow turns all of your normal arrows into poisoned ones. This is a great bow to equip when focusing on damage over time & dealing poison-based damage attacks. It's best to pair this weapon with a poison-based armor set such as the Snake Set. This will ensure that you can deal massive damage over time not only with poison debuffs but poison attacks. 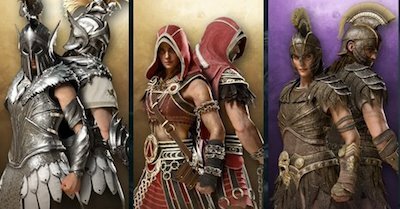 Check Out Legendary Armor - Snake Set! 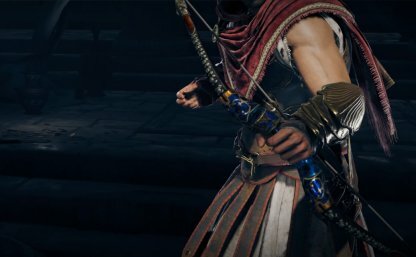 Players will receive Paris's Bow at the end of Episode 8 after you finally kill the Cultist Kleon the Everyman. 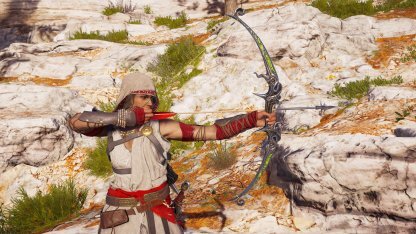 The already powerful Ghost Arrows of Artemis Ability becomes even more powerful when use with Paris's Bow. It provides 20% more damage to the ability! 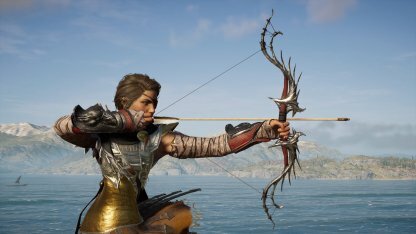 Use Ikaros to know enemy positions when using the Ghost Arrows of Artemis with this bow. Additionally, move from your spot upon firing so enemies can't track you down. Did you seriously just spoil the fact that Kleon is in the cult? What the hell? Thanks a lot.